The value of a new A330-200 has continued to deteriorate in line with expectations given the arrival of a replacement type in the form of A330-800 which hitherto has failed to inspire any enthusiasm. The value of a new aircraft does not seek to represent the cost of buying the aircraft from the manufacturer but seeks to reflect the value of the aircraft on the basis that upon delivery from Airbus it was then immediately sold in new condition to a third party. This new net price also assumes that the aircraft is sold as a single unit for cash. Most customers buying an A330-200 from Airbus will be placing an order for more than one aircraft and will likely be securing discounts from the engine manufacturers. The value of a new A330-200 delivered in 1998 – twenty one years ago – approximated $94 million. This started to rise as the type was ordered in greater numbers after ILFC became the launch customer. The events of 2001 saw the value of the -200 – indeed, all aircraft – fall by a significant amount before recovering. However, as the aircraft was relatively new then the decline was modest in comparison with some other types. The net value of a new aircraft recovered quickly as the aircraft once again was in demand not least because it was seen as a replacement for the B767-300ER. But with the revival in the fortunes of the A330-300 and the desire of operators to lower seat mile costs, the -200 began to lose favor and new net values faltered before sustaining a significant fall in the wake of the financial crisis. 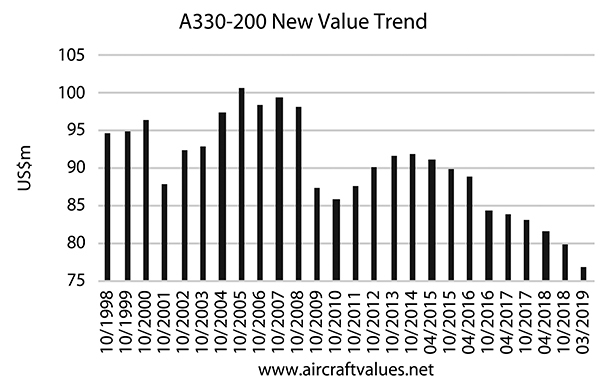 With the launch of the A330neo and the focus on the -300, the value of a new -200 managed to record only a marginal improvement before facing sustained downward pressure. Despite the effect of inflation, the value of a new -200 is today is nearly $20 million lower than 20 years ago. This effective deflation has inevitably had a major effect on values of used aircraft.